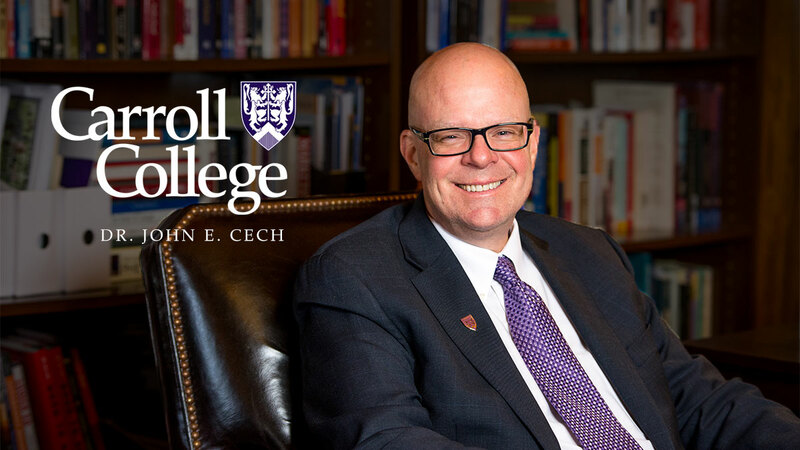 Dr. John Cech is the 18th President of Carroll College. Dr. Cech previously served in the Montana University System for the past 16 years, first as the leader of City College at MSU Billings, which doubled its enrollment and significantly expanded its campus footprint under Cech’s leadership. Cech spent eight year as Deputy Commissioner of Higher Education for the Montana University System, where he was responsible for Academic, Research, and Student Affairs for the State. During his tenure, the Montana University System was recognized for its work through Complete College America as one of four states in the nation to make systemic advances in key initiatives around student success and completion. Cech has led the CCA efforts for Montana and was recently appointed by the Complete College America President as one of 50 CCA Fellows in the nation. Prior to his tenure with the Montana University System, Cech served Rocky Mountain College for 15 years, first as a faculty instructor, then as a director, and eventually as Dean of Community Services, Continuing Education and Summer Sessions. Cech earned a doctorate in higher education leadership, a master’s degree in nonprofit management, and a baccalaureate in business administration and computer information systems. Cech is also looking forward to working with Carroll faculty and staff to underscore the importance of the liberal arts as the foundation of Carroll’s academic programs and to explore opportunities for expansion of graduate and undergraduate opportunities for students at the College. During his interview, he discussed his desire to engage faculty, staff, students, alumni, and trustees to create a shared vision and strategic plan for the future of Carroll College. “Carroll’s future is so bright given its amazing academic reputation with outcomes such as highest athletic GPA in the NAIA conference, 85 percent acceptance rate into medical school, and nearly 100 percent acceptance rate into graduate schools,” said Cech. Prior to applying for the presidency, Cech and his wife Victoria already had a special familiarity with Carroll. “As the parents of a Saint (son Isaiah is a current senior), both Victoria and I believe in Carroll College, its mission and the large impact the Carroll experience has on students,” said Cech. Cech assumed the Carroll presidency in June 2018. He replaced Rev. Stephen Rowan, PhD, who served as interim president for the college since August 1, 2017, after former President Thomas Evans, PhD, stepped down to accept the position of president at the University of the Incarnate Word in San Antonio, Texas.